Street trees can be a huge maintenance headache, but are they worth it anyway for a fiscally prudent city? What do we think of land banks? Why isn’t “efficiency” always a good thing for cities? What the heck does “vibrant” mean? And more of your questions answered in the video and audio from April 2019’s Ask Strong Towns webcast! Every other month we host a live webcast where Strong Towns members can ask their questions of our President Chuck Marohn and Communications Director Kea Wilson. Members: Don’t miss Ask Strong Towns on April 18th! Once a month we host Ask Strong Towns, a members-only live Q&A webcast. Here’s the video and audio from this month’s. Our next Ask Strong Towns: Celebrity Edition webcast features special guest Alan Mallach, author of The Divided City. Sign up to ask him your questions in this members-only live Q&A on March 21st! We’re sharing the video and audio from our January 2019 live webcast Q&A with mega-retail expert Stacy Mitchell. Today we're bringing you the video—and audio, if that’s more your jam—from the latest edition of our live, bimonthly ask-us-anything webcast, Ask Strong Towns. We’re sharing the video and audio from our November 2018 live webcast Q&A with renowned urban planner, walkability expert, and author of Walkable City Rules, Jeff Speck. What's the one thing you want to know most about the Strong Towns approach? On November 16th, you can ask us anything. And we mean anything. As part of our membership drive, Chuck Marohn invited Strong Towns members to submit their questions—any question—and today, on a late-night, Mountain Dew-fueled podcast, he's answering them. At the Congress for the New Urbanism in Detroit this year, we opened the floor for any and every question that our members and readers wanted to discuss. A code smell is a piece of code that correctly executes a given task (i.e. it's not a bug) but its construction indicates deeper flaws in the logic and design of a program. We invite our members to submit their questions on anything they would like out thoughts on. This week we talk RSS feed, irrational fears and organizing members. Ask us a question; we'll find you an answer. This week we get caught up on some Ask Strong Towns questions including ones on stroad repair, traffic engineers and making cool maps. What combination of increase in private investment and downsizing of public investment will give my city a private to public investment ratio of 30:1? How does the segment of ST members who are not planning professionals or government officials can learn enough to effectively advocate for Strong Towns - to become Strong Citizens. Our challenge is not bringing order to successful chaos but creating successful chaos within a well-ordered failure. We invite our members to submit their questions. We’ll give you a Strong Towns answer or find an expert who can. This week’s question is submitted by John T.
The City of Iowa City is in the preliminary design phase of Dubuque Street, a four-lane, partially divided arterial street leading into town. 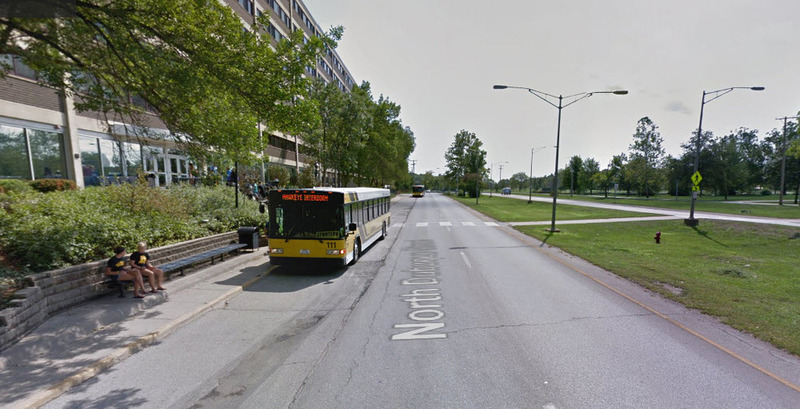 The University of Iowa has bus service on a portion of the street. City Staff's recommendation for most of the project was a 35mph speed limit with 12-foot lanes. Community members advocated for a 25mph speed limit with 11-foot lanes. Last night, the City Council agreed with our position. City staff, however, recommended a 2.5-foot curb and gutter, measured separately from the lane width, and City Council agreed. In my view, we've ended up with a 13-foot curb lane, much wider than desired if controlling speeds is a concern. References I've been using, "Designing Walkable Urban Thoroughfares: A Context Sensitive Approach" by ITE/Congress of the New Urbanism, and "Walkable City" by Jeff Speck, make no mention of the curb and gutter as a design element distinct from the traffic lane. My assumption has been lane width is taken from the face of curb, with the gutter included in the curb lane width. Please advise. I’m probably not going to endear myself to you with this response, but I think both the staff and the community members have this wrong. If I’m looking at the area correctly, this is not a street but a road, which is to say that it is a high speed connection between two places. You leave the interstate and head south into the heart of the city. The objective here should be high speed travel. You can easily travel 55 mph through this section as it is designed today. When you get to the bus stop at the University, you are injecting a little bit of street function into the roadway (but just a little bit). There are some design approaches that could be used here to keep the road function strong yet accommodate the university. A median between the bus stop lane and the two travel lanes would allow traffic to continue at high speeds along the road while having the street function where it is needed for the bus pickup. Dubuque Street in Iowa City. Creating a separated bus pickup would allow the road function to continue unimpaired. The more difficult question is how to get students over to the recreational trail on the west side of the roadway. In a world where we don’t care about roads/streets, we do what they have done here already, which is to pretend there is no distinction and just run the sidewalk perpendicular to the road. Maybe traffic counts are low enough – and students agile enough – where they can judge the gaps (although that might be a little more dangerous Saturday nights). 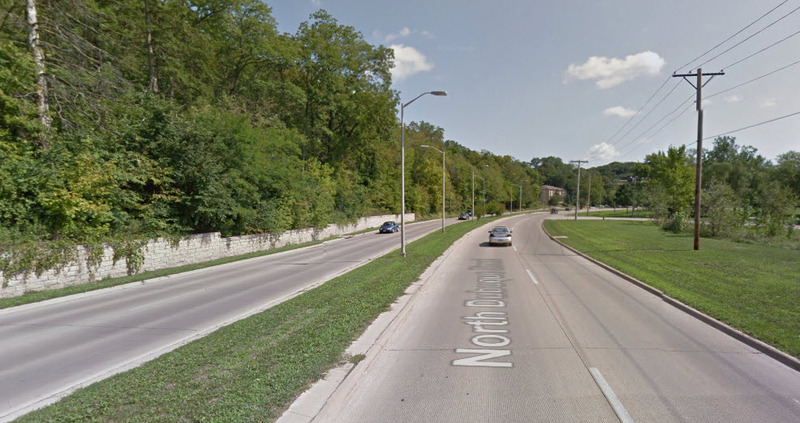 Ultimately, if Dubuque is going to function as a road though this section, there should not be a pedestrian crossing unless it is grade separated (bridge or tunnel). The question then is whether or not this can function as a street through this section, which seems to be the desire of citizens with the suggested 25 mph design speed. A street is a platform for creating and capturing wealth. While there is plenty of room here to slow traffic, develop a node and attract investment, this is not happening here already. Not only would there be lower-hanging-fruit for the community to seek investment, I suspect the desire of residents is to have a more natural park area without intense development. Thus, making this a street does not seem viable. Land across from the bus stop. Does not seem likely that Iowa City will be able to create a lot of community wealth here, so making Dubuque Street an actual street here does not seem viable. To get to your specific question on how to measure the width of the lanes, I agree with you that it should be measured curb face to curb face. The mischief you describe is something we see quite often, where intransigent staff “loses” the fight but then redefines the parameters so that the elected officials can both support their constituents and acquiesce to the staff. Down in the Minneapolis area, I have seen staff actually present this as a “curb impact zone,” as if the curb needs to protected from traffic. This is really frustrating because it does not represent sound engineering practice but simply adherence to dogma with a touch of vindictive thrown in. So yes, I will confirm your belief that you are getting messed with. It the lanes are 13-feet measured from the curb face, then you have a 13-foot lane. If it is approved that way, then I would start advocating for striping that at least provides some of the boundary function on the curb side. In other words, make them stripe the lane at 11 feet. And just one last thought: if you are designing a 35-mph stroad (35 mph is, by definition, stroad speed) or if you are designing a street at 25 mph, you don’t need such wide lanes. To really be a street, your design speed should be lower – 20 mph or less – and your lanes even narrower, ten feet or less. Eleven and twelve foot lanes are stroad size, especially where there is no parking on the side of the street. You’re having a battle here where both sides are guaranteed to lose. You can become a member of Strong Towns, and ask your question today, by going to our membership site.